For the busy hen that spends her days free ranging, you can't beat this all in one nest box and shelter! 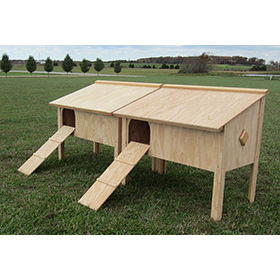 It's designed to give your flock a "home away from home." They'll naturally be drawn to it for egg-laying--it's safe and secure, with a privacy panel to make it dark inside, just like they like! (This way you won't have to go on an egg hunt for your breakfast every day...) Egg collection is easy--the roof lifts right up. 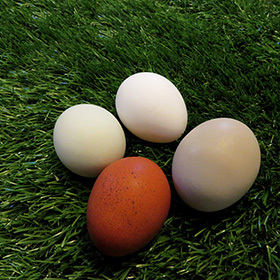 Place it in an area where your free-ranging hens like to go, and they'll use it as a shelter in severe weather, too. The roof overhang provides some protection against driving winds. This product is made in the USA out of fir and cedar, so it will be incredibly long lasting. It's pre-assembled--all you have to do is attach the legs using the included screws and a Phillips head screw driver . 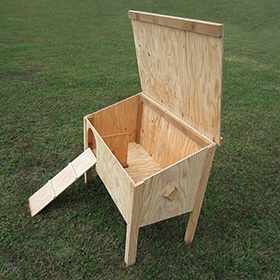 The Busy Girls Nest Box is unfinished, so you can let it weather naturally, or finish it with the stain of your choice. 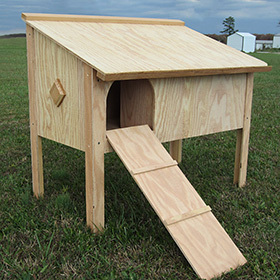 Please note: this is not intended as a chicken coop. There is no protection from predators. Shipping and Returns: Please choose "Ground" shipping when you check out. Will ship via UPS Ground. There is a 15% restocking fee for returns on this item and the item must be returned in the original packaging. Please note: we do not have a storefront and orders cannot be picked up from our location.Also, we can only ship within the United States. 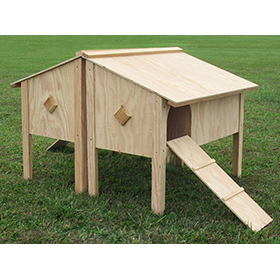 Shipment of chicken coops is limited to the 48 contiguous states but not Alaska, Hawaii, Puerto Rico and the other U.S. territories.